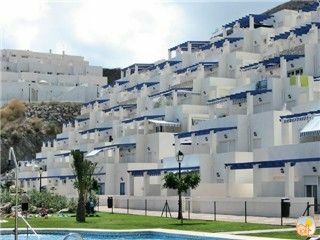 The apartment is perfectly situated on the Mojàcar Playa approximately 400 metres (2 minutes walk) from the beachfront, giving easy access to the restaurants, shops and 17 kilometres (10 miles) of sandy beaches. However, being set into the hillside means that it provides a fantastic view of the sea and a tranquil escape from the seafront if required. The Mojàcar region has a wonderful climate with average temperatures between 7-10 degrees higher than the UK, even in January the average temperature is 11 degrees. The apartment is a well-maintained apartment on a new complex. It has an amazing view as well as close proximity to all the beach front amenities. It has landscaped gardens and 3 communal pools and a tennis court. Our apartment has groundfloor access enabling it suitable for heavy luggage, the elderly and disabled. It also has lifts for keyholders allowing easy access to the pools and to the beach. The apartment consists of 2 bedrooms with attached small balconies, a bathroom, kitchen, living area and large main balcony. Nice apartment complex, great pools, close to sea. Nice clean place, with a great terrace over looking the pools and the sea. The only thing that lets the place down is the beds and mattresses, very uncomfortable, and all singles. Apart from that it’s a good apartment. This spacious apartment is well-equipped and on a quiet development - which is kept immaculately clean and tidy. The sea views from the balconies are stunning and the pool areas are rarely busy and are beautifully kept. We especially liked the little trees to sunbathe under. It is less than five minutes walk to a good selection of restaurants and bars. The sandy beaches are also a short walk away, as are local shops. We had a car to explore the local area and old town (up in the hills, and well worth a visit) but there was also a good bus service. Would highly recommend!! Beautiful clean apartment with great views. Lovely complex. And close to restaurants, beach and bars. l appartement face à la mer est au calme et les piscines en bas vous attendent.Il est spacieux et permet d'explorer la région en toute sécurité.Nous avons aimé nos vacances même en août avec la chaleur et la foule grâce à ce petit havre de paix. I was very happy with the property. It was clean and well maintained. We had plenty of space and it was very comfortable. I found the facilities very safe and child friendly. It was a short walk to the beach and the many restaurants. I would absolutely recommend this property to others and hope to go back myself in the near future. Love this appartment will be going back for the fourth time in July. The three pools and gardens are spotless and for some reason the pools are never busy which is great. The apartment is well equiped for every thing you might need. Five minute walk to the beach and plenty of bars and places to eat. There are a host of activities in the area including diving, a plethora of golf courses (see link below) including the world famous ‘Desert Springs’ golf course (see link below) which hosts many pro-celebrity tournaments (Ian Botham has a property on the golf complex) and has many facilities open to the public; boat trips, horse riding, 4x4 drives, mini-Hollywood, Go-Karting, an Aqua park, historical places (such as Cuevas Castle), Cabo de Gata natural park. For racing fans there is the Almeria Racing Circuit which hosts high profile racing events and offers formula driving school days, for specific details (see link below ). Mojàcar Playa also has many clean, well-maintained children’s play areas repeatedly along the beach front area. All of these are on top of the many bars and restaurants in the area. For the more adventurous Granada is only a 2.5 hour drive away where there is the spectacular Alhambra Palace and Winter Ski-ing (see link below).